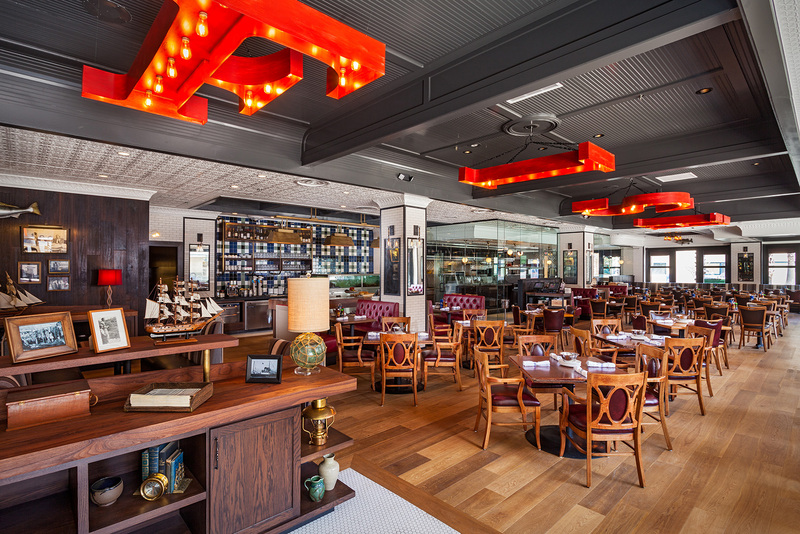 The popular family dining destination, King’s Fish House, has recently debuted a new modern design at its original location on Pine Avenue in Long Beach. Opening more than twenty years ago, the stunningly redesigned restaurant also features exciting new menu items and a curated handcrafted beverage program. Under the direction of Hatch Design Group, the main entrance was moved to Pine Avenue to create an open floor plan. Bi-fold windows line the dining room’s modern exterior, and can open to let in the ocean breeze, while garage door windows have been placed in the bar area, creating a lofty and airy atmosphere throughout the restaurant. In the center of the dining room’s ceiling hangs four large marque signs lined with Edison lightbulbs, playfully serving as the restaurant’s chandeliers and spelling out the word that says it all: “FISH.” Additional new décor elements throughout include original New York subway-tiled columns, an impressive 1,000 gallon salt water tank to house live seasonal shellfish, a 15-foot working harvest table, and exquisite pine wood floors. 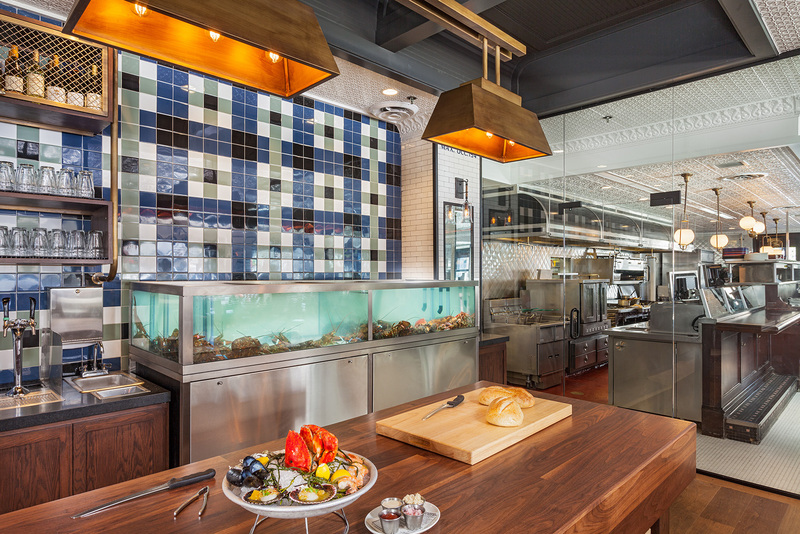 A glass-enclosed kitchen gives diners a front row view of the bustling interior, where they can see the chefs in action. But perhaps the most eye-catching element of all is an exquisite wraparound raw bar with white marble countertop, the perfect backdrop for the restaurant’s abundant shellfish options, such as a daily rotation of 9-10 seasonal oysters from both coasts, Wild Baja Stone Crab, Farmed Peruvian Bay Scallops and Penn Cove Black Mussels. 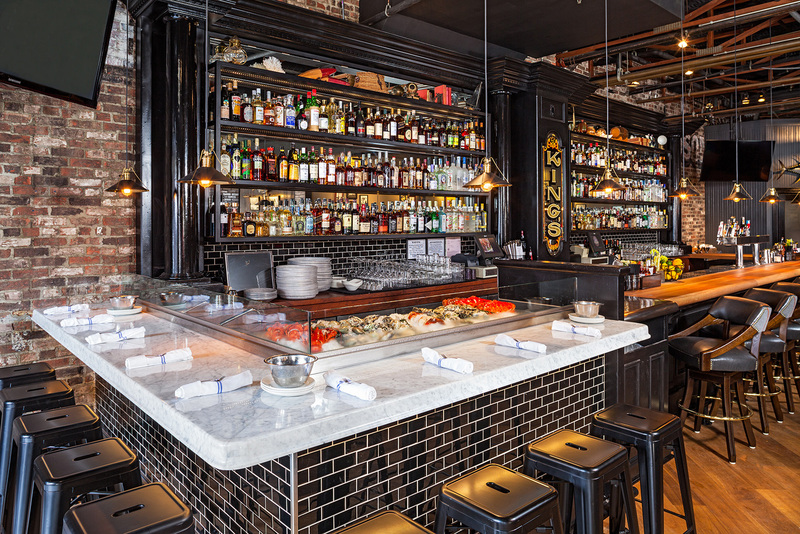 The bar has been refreshed with a striking steel and mirror shelving unit to house the restaurant’s new spirits, which are used in the enhanced cocktail program. Craft cocktails are made to order with artisan ingredients and include the “Perfect” Manhattan made with straight rye whiskey, Vya sweet vermouth, orange and Angostura bitters and finished with scorched orange oil. The bar also includes a new 16 – tap beer system, serving local and hyper-local craft beer such as King Harbor Brewing Company (Redondo Beach), Timeless Pints Brewing Company (Lakewood) and Golden Road Brewing (Glendale) served in 16oz, 22oz and 60oz pitchers. Happy Hour has been extended to Monday through Friday, 3:00 p.m. to 6:00 p.m. with food and drink specials from $4.00 to $9.00.